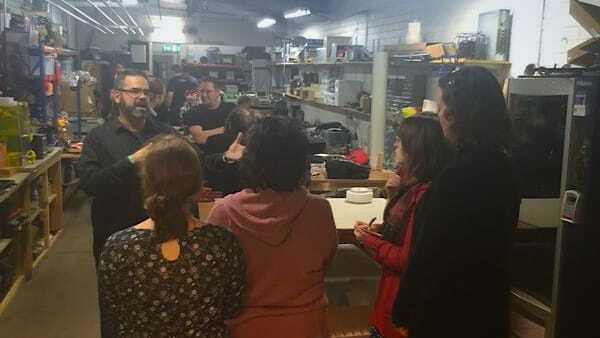 The Australian Library and Information Association (ALIA) students and new graduates came down to the Connected Community HackerSpace (CCHS) and explored what a Makerspace had to offer to the Library Services. Organised by the good friend and fellow maker, Jennifer Strover @jenniferaviva I was happy to come down and share not only what I know from a maker’s perspective, and also integrate it with the experience I have running the Makerspace at Library at the Dock. I had a great time sharing what I know, and from all reports, the ALIA students & new grads had a blast seeing what was on offer andwhat is possible in the maker community. They even had a chance to play with my Zombie Detection Scanner that lives at the CCHS. Click the link below and check out what the ALIA students had to say!